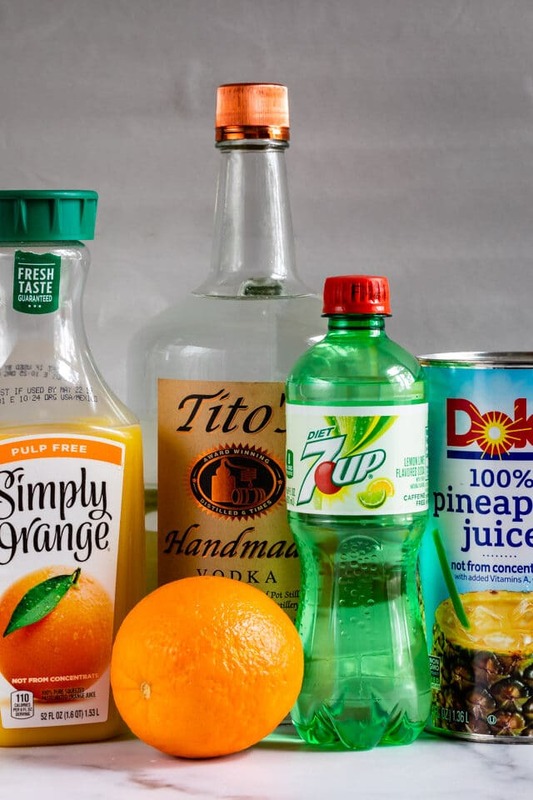 Orange Vodka Party Punch is an easy cocktail recipe for a party. 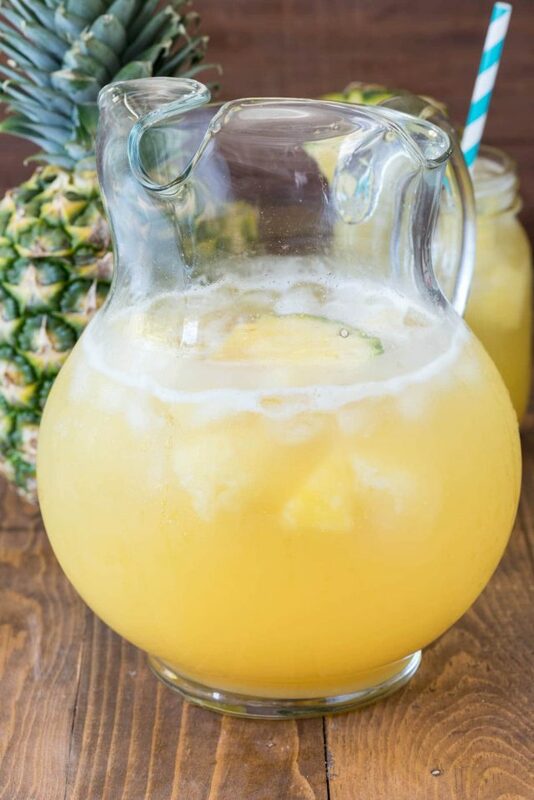 Just 4 ingredients make up this easy punch recipe: orange juice, pineapple juice, vodka, and soda! I’m going to give you guys a tip: don’t go out and have drinks on a Wednesday night. Because then you wake up and it’s only freaking THURSDAY. Anyway! Now that it’s Thursday, it’s acceptable to have a cocktail after work. Because if you drink a couple too many you’ll wake up tomorrow and it’ll be FRIYAY. When I’m reaching for a cocktail that’s not wine, it’s going to be vodka. Unless I’m in Hawaii or somewhere tropical where rum is the spirit of the moment, vodka’s my girl. I can’t drink tequila without serious repercussions and whiskey…just no. It seems that you guys like vodka too because my Fruity Vodka Party Punch is consistently #1 in my analytics. I decided to make a new flavor and I gotta say, it’s fantastic. Orange Vodka Party Punch has orange and pineapple juices mixed with vodka and lemon-lime soda. It’s refreshing and the perfect party drink! If I’m being honest I don’t love orange juice so I didn’t think I was going to like this drink that much but I was wrong: it’s delicious. I think the addition of the pineapple juice really gives the drink the depth of flavor it needs to not just be a screwdriver (orange juice and vodka). With only 4 ingredients this easy cocktail is going to be the hit of your next party! Heading into spring and summer we need lots of punch recipes for parties and this one is perfect. 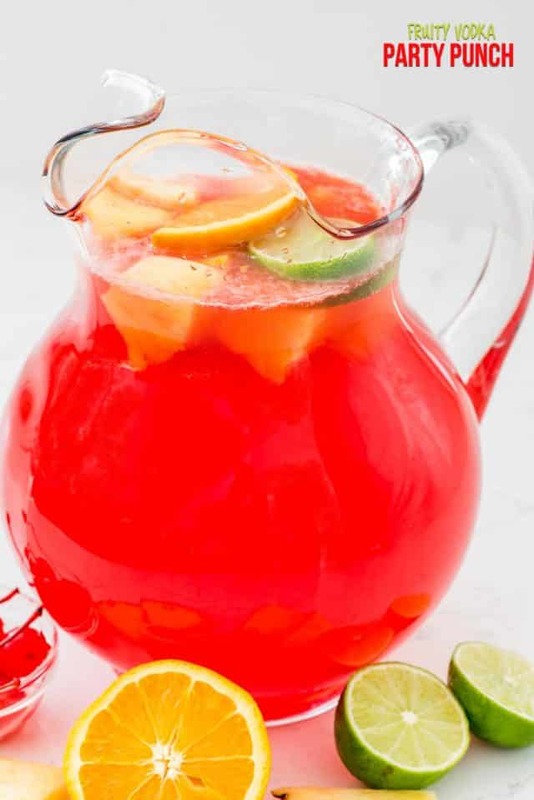 Whether you’re celebrating Easter, Mother’s Day, heading to a Memorial Day BBQ or 4th of July gathering or just a pool party, punch is great because it serves a crowd. Another thing I love about making party punch is that you can adjust the recipe to fit your needs. If you think my vodka punch ratio is too strong, add more juice. If you think it’s too weak, add more vodka. Punch is where you can kind of be a mad scientist and it’s not going to kill the recipe. The kind of vodka you use in party punch does matter. I know that people might think that, because it’s punch and not a shot, that you can just use cheap vodka, but that’s not really the case. As I’ve aged I’ve realized that buying better brands of liquor is like buying that mid-range wine: it just tastes better and gives you less after effect. Be sure to use a vodka you like to drink straight or mixed with plain soda. My favorite is Tito’s but I also recommend Skky or Kettle One or Smirnoff. How long does vodka party punch last? The soda will get flat after a day or so unless you put this in a sealed container. If you want to use it for a few days or make it ahead, mix the juices and vodka and then add the soda right before serving. 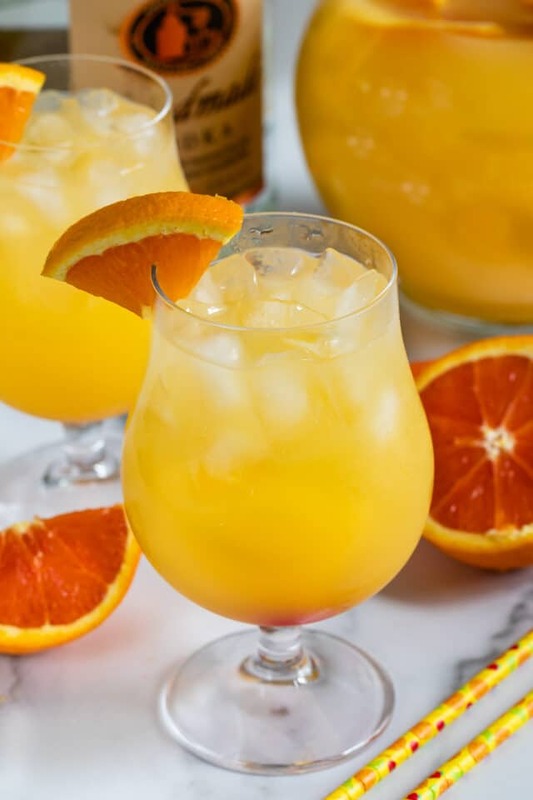 How can you make a kid-friendly orange party punch? It’s super simple to make this into a mocktail (a punch without alcohol): just omit the vodka and add more soda to taste. 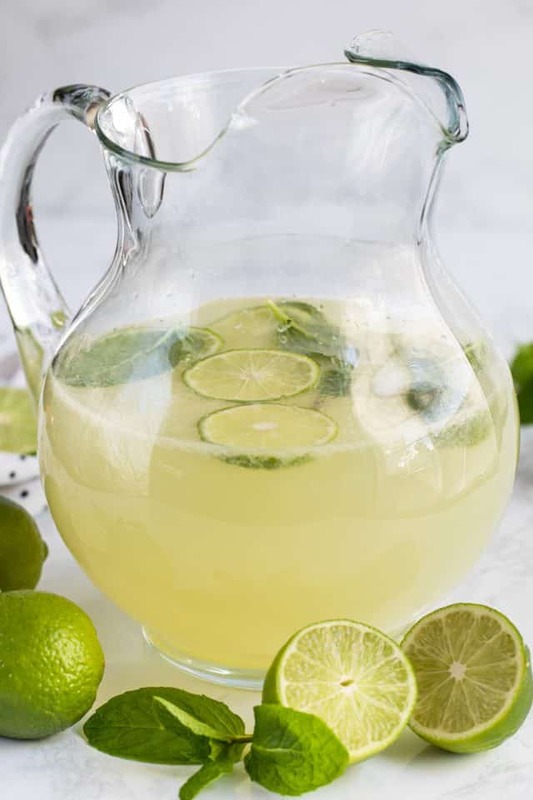 If you want, make a big pitcher of this without the vodka and allow your guests to add the vodka after they pour so there is not any risk of the kiddos getting into the punch. Simply garnish this punch with a cherry and an orange slice and you have the perfect punch recipe. I promise your guests will love it! 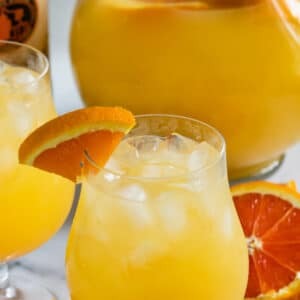 Orange Vodka Party Punch is the perfect cocktail recipe for a party with just 4 easy ingredients! Make sure all ingredients are cold to start. Mix in pitcher. Add sliced oranges for garnish. Serve over ice. Want it stronger? Add up to 1 cup more vodka. Make this a mocktail by omitting the vodka and adding more soda. Make serving to all guests easy: make it a mocktail punch and have the vodka nearby so guests can add it as they please. Make this ahead of time by mixing the juices and vodka. Add the soda right before serving. Well, heck. Since this has orange and pineapple juices, it’s got to count as a serving of fruit!